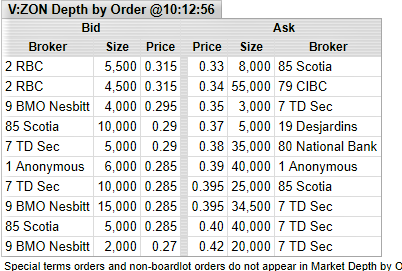 Could the stock be halted soon for a news release,a lot of activity today ? Maybe not all today,but it might be possible this week,little chunks here and there,and the 80k at $0.34 is gone,let's be positive. Did all the shorts covered already ? Last Edit: 6 hours 36 minutes ago by ron. If you look where the deposits are in NWT and north Labrador, they are all very remote, expensive to explore and summer work only. It would also be hard to raise exploration funds for these remote locations, especially the last several years. They probably can be expanded. That is a big advantage at Cross Hills, year round and road access, power line through property and sea port nearby. Easy terrain. Accommodations nearby in Terrenceville. None of those deposits are very big?